Summer baby seasonhas arrived, and whether your arrival is a boy or girl, MemorableGifts.com has adorable ideas and thoughtful presents personalized baby gifts will preserve this precious time for years to come! Here is a list of our top baby gift ideas to honor a new baby! 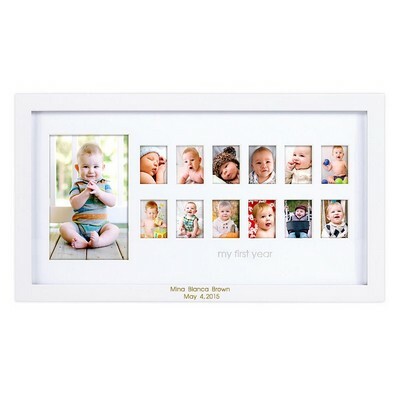 This personalized frame is a great way to document a baby’s first year, with space for a 4″ by 6″ center photo, and 12 wallet-sized pictures for a month-by-month montage of growing up. Further personalization is found with Baby’s name engraved under the center photo, for a truly distinguished baby gift! 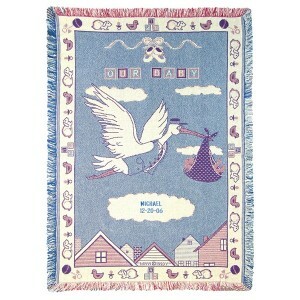 Wrap up the new arrival with this adorable cotton afghan, complete with a stork theme and place for the child’s name and birth date. Surprise a new mom and dad with this 46″ by 33″cotton throw, perfect for any new boy or girl! 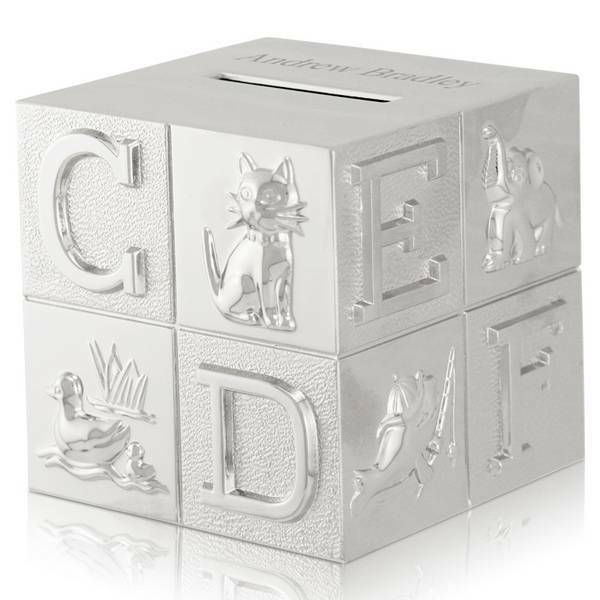 It is never too early to start saving for Baby’s future, and this personalized silver baby bank is the perfect way to start! Everyone enjoys this classic and traditional gift, with four full lines of personalization available to record the infant’s name to create a special message. This glass ornament for babies is a fantastic memory-making gift for new parents. A perfect display of the babies photo and birth records. 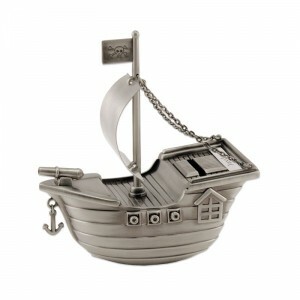 Pirates are a popular theme, and this pirate ship bank delivers plenty of space for storing booty and space for personalization with the newborn’s name! Sure to bring smiles at any baby shower, this bank has all the details, a pirate flag, mast, cannon and even a little anchor embellishment. 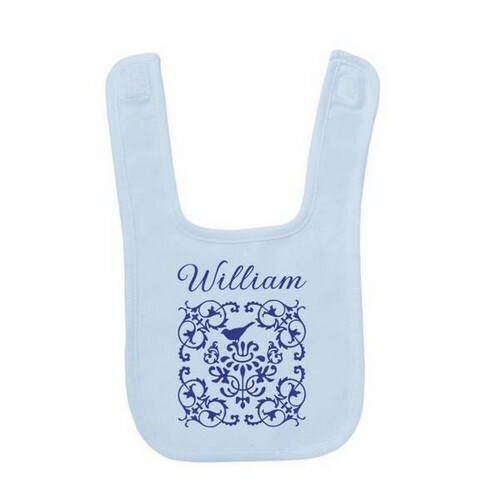 This unique personalized baby bib makes a unique gift for a baby. The bib is made with a cotton/poly blend for durability. 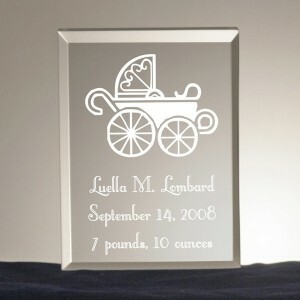 The baby acrylic keepsake is a great way to announce a new birth, and is sure to become a treasured family memento. 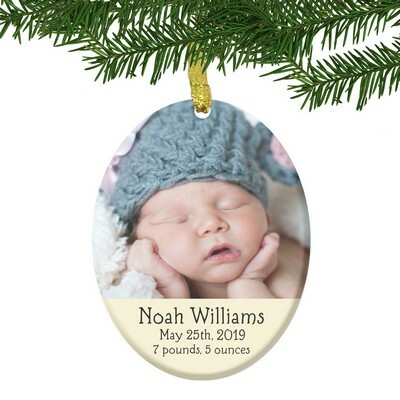 With a baby-buggy depiction, the plaque has room for a baby name, birth date and weight, and makes a thoughtful addition to a group gift or a monetary present! When looking for a baby gift with a personal touch, look no further than Memorable Gifts. We offer gifts to celebrate a new birth and that are sure to become cherished remembrances of a child’s first few moments in life. What a beautiful baby keepsakes! These customized items signify a unique expression of thoughtfulness and are ideal as gifts for others or to keep in your own home. A keepsake baby birthday gift like a bangle, bracelets which are set using baby’s birthstone, a beautiful music box which makes the baby to be happy for long and a photo album which is filled with pictures of it, all of these gifts can be treasured possessions. Nice article.